Carol Moseley Braun is a former (EMILY's List-supported) Senator from Illinois (1992-1998) and former U.S. ambassador to New Zealand (1999-2001). Born in 1947, Carol Moseley was raised by a medical technician mother and a "socialist" father who worked as a guard in the Cook County Jail. In 1978, Braun was a leading member on the Committee to Elect Dr. John R. Lumpkin for the 7th Ward Alderman, Chicago. John Lumpkin was the son of prominent Chicago Communist Party USA leaders Frank Lumpkin and Bea Lumpkin. In 1978 Mosely Braun won election to the Illinois State Legislature. Moseley Braun became legislative floor leader for then Illinois Congressman Harold Washington and sponsored billsto reform education, to ban discrimination in housing and private clubs and to bar the State of Illinois from investing funds in Apartheid South Africa. In 1987 Moseley Braun joined Harold Washington's multi-ethnic, multi-racial, and gender-balanced "Dream Ticket" to successfully run for the office of recorder of deeds. Washington died in office shortly after the election. List of founding sponsors of the U.S. Peace Council, November, 1979. "Partial List of Sponsors", included Carol Moseley Braun. On April 6, 1983, the Hyde Park Herald published an endorsement from the Hyde Park/Kenwood Citizens Committee of Democratic Party Chicago mayoral candidate Harold Washington. Signatories to the endorsement included Carol Moseley Braun. Harold Washington was involved in Communist Party USA front and had been elected as Chicago's mayor in 1983, by a communist/socialist led black/white "liberal"/Latino coalition. Moseley-Braun was also close to the Communist Party USA. In November 1979 she was a co-sponsor, with Congressmen Ron Dellums and John Conyers of the founding conference of the Communist Party-led U.S. Peace Council, an affiliate of the Soviet controlled World Peace Council. Carol Braun, of Chicago, was on a May 2, 1985 mailing list for Chicago Women for Racial and Economic Equality - a front for the Communist Party USA. In May 17th 1987 Moseley Braun helped sponsor, with Communist Party leaders Angela Davis and Herbert Aptheker, a benefit for elderly Chicago Party leaders Claude Lightfoot and Jack Kling. On September 7, 1991, more than 300 people gathered at the St James methodist Church on Chicago's South side to remember the life of Communist Party USA national committee member, Claude Lightfoot. Speaker Carol Moseley Braun told of "having been enriched by a dinner converstion with her late father and Lightfoot, which gave her a deeper insight into the struggles of the unemployed in the 1930s.". While serving as recorder of deeds Moseley-Braun decided to run for United States Senate in the 1992 election on the Democratic Party ticket. Like her mentor, Harold Washington, Moseley-Braun was supported by the Communist Party USA. Lumpkin also led SOJ into independent political action. They played an important role in the election of Harold Washington as mayor of Chicago, a historic victory over the most entrenched, reactionary political machine in the U.S. Bea (Lumpkin's wife) writes that "At that time, Washington and Lumpkin had a special relationship ... Washington seemed to draw strength from Lumpkin's participation. At meetings rallies, street encounters, whatever, Washington would call Frank over and say, 'When I see you, I know things are in good hands." 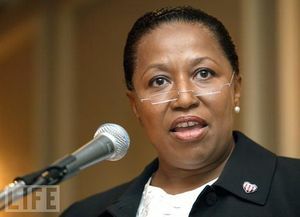 SOJ was also an important factor in the election of Charles Hayes, African-American leader of the Meatcutters union, to take the Congressional seat vacated by Washington, and the election of Carol Moseley Braun, the first Black woman to serve in the U.S. Senate. An innovative school reform bill was announced March 18, 1985 by three Chicago legislators, Rep Carol Moseley Braun (D-25)Rep: Al Ronan (D-l2), and Sen. William Marovitz (D-3)' described the Urban School Improvement Act as "the single most important step we can take to solve the Chicago school crisis." According to an article in the Communist Party USA paper, Daily World, by Mildred Williamson, under the proposed legislation, each local Chicago school must establish a School Improvement Council made up of equal numbers of parents and school staff. This council then develops a three-year plan for improving basic skills instruction, cutting dropout and truancy rates, and improving preparation for further education and for employment. Schools with a developed plan will be given $100 per student to help them carry their plan out, and they decide how this additional money will be spent. This bill as well as many other aspects of "building unity for struggle" to improve the schools was discussed at a conference of300 parents and community activists on Saturday, March 16. 1985, The three legislators were present, along with Mayor, Harold Washington, who gave the morning address. The conference was called by Schoolwatch, a parent organization sponsored by Designs For Change, a Chicago-based research and children's advocacy group. The Schoolwatch conference was held at Whitney Young High School on Chicago's West Side, The primary purpose of the conference was to acquaint parents with their rights in the Chicago Public School System, and prepare them "to struggle for much, needed improvements." Dr. Donald Moore, executive director of Designs For Change, explained why they have strongly recommended this program. "Independent evaluations show that it, has brought major improvements in California schools. Because of its success, the program has been extremely popular. Groups ranging from the California' Parent Teacher Association to California's American Federation of Teachers have lobbied for the program from the beginning and want it expanded". In 1991, the Communist Party USA split, many Chicago Party members and other socialists joining forces to found a new organization, the Committees of Correspondence. One CoC and Democratic Socialists of America member Timuel Black, Professor (emeritus) City College of Chicago, was a long time friend and supporter Moseley-Braun. One lifelong Communist Party member to join the CoC was the late Chicago activist Hannah Cohen. Hannah became a community volunteer in the mayoral campaigns of Harold Washington, and was one of the key volunteers in the election campaign of Carol Moseley Braun, the first African American woman elected to the United States Senate. Chicago was also home to an alliance of remnants of the Socialist Party USA and former Trotskyist and communist activists. This group held an annual dinner, to mark the the birthday of legendary U.S. socialists Norman Thomas and Eugene Debs. Democratic Illinois State legislator Robert Mann was closely associatedwith this group. When Mann stood down in 1978, the socialists looked aroundfor a successor. Carol Braun was then elected to the Illinois State Legislature, with socialist support. In 1982-3 the Chicago socialists involved in the annual Thomas-Debs Dinner joined with members of the New American Movement to form the Chicago branch of a new organization, the Democratic Socialists of America (DSA). DSA infiltrated the Chicago Democratic Party and was to play a role in electing Chicago's mayor, Harold Washington and in furthering the careers of Carol Moseley Braun and later Barack Obama. In 1992 Carol Moseley-Braun was persuaded to run for the U.S. Senate. One woman, Democratic Socialists of America member and long time Chicago Democratic Party activist, Sue Purrington played a role in Moseley Braun's decision. The 34th Annual Dinner was held on May 1, 1992 at the Congress Hotel in Chicago. The Master of Ceremonies was Michael Lighty, who was then the Executive Director of DSA. Sue Purrington, the Executive Director of Chicago NOW, and Dr. Quentin Young, President of Physicians for a National Health Program, were the honorees. The featured speaker was Jose LaLuz, who was the National Education Director of the Amalgamated Clothing and Textile Workers Union. Like Michael Lighty, Quentin Young and Jose LaLuz were also DSA members. You were instrumental in persuading Carol Moseley Braun to start her campaign to become Senator from Illinois then you produced votes to back up your pledge of support. Another DSA linked activistassociated with Carol Moseley-Braun was Milt Cohen. In 1982, Rep. Harold Washington issued a challenge to register 50,000 new voters in preparation for the coming mayoral election. Milt helped organize a grassroots movement which met the challenge by more than double. Later he chaired the Chicago Coalition for Voter Registration. Milt joined the 1983 Washington campaign full-time. He later said that hard-won victory was his greatest satisfaction. The Washington movement clearly reflected Milt's long-time priorities: anti-racism, political independence, and progressive multi-racial coalitions. A few months after his election, Washington issued a proclamation declaring Milton M. Cohen Day a day for Chicagoans to honor a man "who has dedicated his life to the unceasing struggle for the civil and economic rights of all people and has worked for 50 years in the cause of progressive change and reform politics in Chicago and a more democratic, humane and peaceful America and world." Mayor Washington noted that to honor Milt Cohen is to honor "thousands of rank-and-file activists who work day and night in the struggle for jobs, justice, and peace." Carol Moseley Braun's election to the Senate in 1992 was another landmark for Milt. He had helped recruit Braun for her first legislative race in 1978, and one of his last projects before leaving Chicago was soliciting DSA members to participate in the Braun campaign. Progressive forces in Illinois made history November 3 by electing Carol Moseley Braun as the first African-American woman to the U.S. Senate. Braun beat beat Republican millionaire Rich Williamson soundly, 57%-43%. Former DSA Youth Organizer Jeremy Karpatkin directed Braun's field operations. Chicago DSA contributed volunteers and money to Braun's campaign. Chicago DSA members are working on the Carol Moseley Braun campaign for US Senate. During her 1992 Senate race Moseley Braun's campaign manager was former Rainbow Coalition activist Kgosi Matthews. Her political director was Heather Booth. The Memorial Service for Chicago Democratic Socialists of America (DSA) member Saul Mendelson was held on Sunday, March 29, 1998, at the First Unitarian Church, Chicago. The service was MC'd by a retired colleague, Bob Clark. Carl Shier of DSA, spoke first and was followed by Saul's friend Deborah Meier, "a MacArthur Genius Grant recipient who is now starting a new school in Boston". Amy Isaacs, National Director of the Americans for Democratic Action, spoke of what "Saul had meant on foreign affairs to the ADA". Other speakers included Communist Party USA aligned Senator Carol Moseley Braun, Alderman Toni Preckwinkle, State SenatorBarack Obama, Illinois House Majority Leader Barbara Flynn Currie and "a good friend from New York", Myra Russell. The concluding remarks were made by an old friend, Harriet Lefley, a former Trotskyist with Saul Mendelson in the 1940s, who was then Professor of Psychology at the University of Miami Medical School. Eulogies also came from Quinn Brisben, (Socialist Party USA presidential candidate 1976, 1992) and David McReynolds (Socialist Party USA presidential candidate 1980, 2000). Both Brisben and McReynolds are also members of Democratic Socialists of America. The Cuban Humanitarian Trade Act, a bill introduced in 1998, in the U.S. Congress, would ease some restrictions on trade with socialist Cuba, solidarity activists say. The legislation would lift sanctions on sales and donations of food, medicines and medical supplies to Cuba. While it falls far short of ending the illegal U.S. blockade, the legislation does meet an important Cuban requirement. It says that trade is an appropriate relationship between the two countries. The 37-year U.S. blockade has meant great hardship for Cuba's 11 million people. President Fidel Castro said in July that "We contend that the economic blockade should be considered among the main war crimes committed against a people." The Cuban Humanitarian Trade Act has 129 sponsors in the House and 25 in the Senate. It is supported by members of the Congressional Black and Latino Caucuses, including Sen. Carol Moseley Braun and Reps. Maxine Waters, Nydia Velasquez and Charles Rangel. IFCO/Pastors for Peace, organizers of the U.S.-Cuba Friendshipment caravans, testified on behalf of the legislation in May. The U.S. Chamber of Commerce, the U.S. Wheat Association, the Medical Devices Manufacturers and other business groups also testified in favor of easing the blockade. The Council for a Livable World, founded in 1962 by long-time socialist activist and alleged Soviet agent, Leo Szilard, is a non-profit advocacy organization that seeks to "reduce the danger of nuclear weapons and increase national security", primarily through supporting progressive, congressional candidates who support their policies. The Council supported Carol Moseley Braun in her successful Senate run as candidate for Illinois. The Aug. 23 2003 march on Washington that marked the 40th anniversary of the giant 1963 Civil Rights March led by the Rev. Martin Luther King, Jr. was noted for its strong anti-war mood. Thousands of people from across the country streamed onto the grounds of the Lincoln Memorial to commemorate the historic march, which featured Dr. King's famous "I Have A Dream" speech. The night before this year's march, Yolanda King hosted a "spit in" geared toward younger activists. Many people took the stage for five minutes each to "spit" poetry against war, about growing up poor and oppressed, about police brutality and other injustices to illustrate that the "dream" has not been realized by most working people in this country. Throughout the weekend the speakers who received the loudest ovations were those who demanded an end to the occupation of Iraq. Among the speakers were three presidential candidates--the Rev. Al Sharpton, Carol Moseley Braun and Howard Dean; historic civil-rights leaders such as James Forman, Coretta Scott King and Jesse Jackson; representatives of the civil-rights/peace-and-justice movement like NOW Executive Director Kim Gandy, National Lesbian and Gay Task Force Executive Director Matt Foreman, Damu Smith of Black Voices for Peace, Leslie Cagan of United for Peace and Justice, James Zogby of the Arab American Institute, Raul Yzaguirre of La Raza, and Mahdi Bray of the Muslim American Association, who invited everyone to come back for the Oct. 25 march against the U.S. occupation of Iraq. National youth and student leaders and church representatives also spoke. On the morning of March 11, 2004, Susan Lindauer woke to find five F.B.I. agents at her front door. After reading her her rights, the agents took Lindauer from her home in Takoma Park, Md., to the F.B.I. field office in Baltimore, where she was charged with having acted as an unregistered agent of Saddam Hussein's Iraqi government and otherwise having elevated the interests of a foreign country above her allegiance to the United States. According to the federal charges filed against her by the United States attorney for the Southern District of New York, Lindauer repeatedly violated U.S. law beginning in 1999 by meeting with Iraqi diplomats at the Iraqi Mission to the United Nations in New York and with agents of Saddam Hussein's Iraqi Intelligence Service (I.I.S.). She was also indicted for accepting money from the Iraqis and traveling to Baghdad, where she met with Iraqi intelligence agents, in violation of federal law. From on or about Feb. 23, 2002, through on or about March 7, 2002, the indictment charged, Susan Lindauer, aka 'Symbol Susan,' met with several I.I.S. officers in Iraq, including at the Al-Rashid Hotel in Baghdad, and received cash payments of approximately $5,000.00. The substance of the government's case against Susan Lindauer was contained in the indictment. While Lindauer was not accused of espionage, as initial reports of her arrest suggested, the government did charge her with a serious crime, even if the charge itself may seem like a technicality. By failing to register herself formally as a lobbyist and by supposedly following instructions from Iraqi diplomats and intelligence agents at the United Nations, the government charged, Lindauer had been acting as an unregistered agent of a foreign government, a violation of federal law that is punishable by up to 10 years in prison. 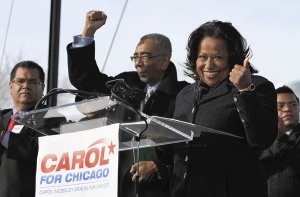 In November 2010, Moseley Braun announced she will be running in the Chicago mayoral election, 2011. The city's incumbent mayor, Richard M. Daley, will not be seeking re-election. Moseley Braun was endorsed by 21st Century Democrats in the 199 election cycle, during unsuccessful US Senate run. In 2013, she served on the organizations Advisory Board. ↑ David Samuels (August 29, 2004). "Susan Lindauer's Mission To Baghdad". New York Times. Retrieved November 7, 2008. ↑ Dao, James (March 12, 2004). "An Antiwar Activist Known for Being Committed Yet Erratic". New York Times. Retrieved June 11, 2008. This page was last modified on 11 January 2017, at 03:45.